The problem with my day job is that I am constantly battling with dry, cracked, sore hands. I’m washing my hands all the time, with, let’s be honest, no Molton Brown soap, then rubbing them dry with paper towels. All day, every day. That mixed with freezing cold weather, my hands are crying out for some sweet relief - so welcome, Hopes Relief. Australia’s number one natural eczema cream turns out to be a cure all for my poor, worked to death hands. 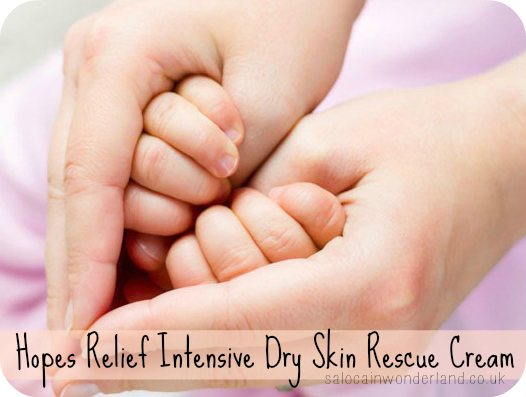 Originally designed to treat eczema and psoriasis in infants, babies and adults, Hopes Relief uses natural botanical ingredients to treat and moisturise dry skin. With natural ingredients including; manuka honey, aloe vera and liquorice root, I was open to giving it a try to try and sooth my sore hands. I hate it when my hands are so dry that even just doing the dishes hurts - though it’s a pretty good excuse not to do them. Free from steroids, hormones, parabens, artificial colours and fragrances, lanolin, mineral oils and more, no wonder it’s so safe to use on little hands as well as big ones. The cream itself is really thick in consistency and is brown in colour - which threw me, it looks like a really dark tinted moisturiser but does dry clear. For a minute, I thought it was going to give me some very tanned digits. Being fragrance-free, it has a very earthy, natural smell to it with a semi-sweet undertone that kind of reminds me of raw cookie dough - but I’m pretty sure you shouldn't lick this like you would the spoon. Being so thick, I was really surprised by how not greasy it was, and it dried in so quickly too. One of the problems I have with using hand creams in work is that they take so long to dry in properly - and have you ever tried to put on latex gloves when your hands have any kind of residue on? Impossible. And painful when they snap and rip and fly back into your unsuspecting face. True story. Hopes Relief instantly soothes and calms itchy skin, and that horrible stretch and crack you get when you flex dry hands is soothed and moisturised. I was really surprised at how quickly my hands felt better. It took a few days of use before they started to look smoother but the pain was gone. I found it most effective on the damaged skin around my nails. A little goes a long way with this one, which is something I love about it, especially as I’m using it so often. It seems to provide a much longer-lasting protection and they claim it doesn’t wash off in water or soak into clothing. All the goodness penetrates deep into the skin, so as the cells regenerate, it’s bright and beautifully smooth skin coming through. Honestly, I was sceptical about the not washing off in water, so I tested it. I moisturised one hand, not the other, left it about half an hour then went and washed my hands. The moisturised hand still felt soft and much smoother compared with the other hand. What’s your go-to treatment for dry, cracked hands? Hopes Relief was kindly sent to me for consideration. All thoughts and opinions are 110% my own :) For more information, see my disclaimer here. p.p.s I need to apologise for the lack of pictures - I took the hand cream to work and once something is in a lab coat pocket, it stays there! Fail! Poor hands. My housemate uses doublebase gel on hers, i think I've told you this before?